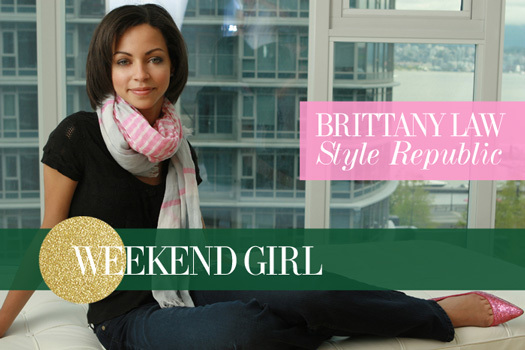 Editor-in-Chief of Style Republic Magazine. Since a young age Brittany was destined to do great things. With a talent for web design and creative writing, launching her magazine was only natural. Her success has skyrocketed, interviewing the likes of Rachel Zoe and Donna Karan to attending NY Fashion Week (obviously with a backstage pass) and collaborating with companies like BCBG. Brittany is a living, breathing, Vancouver sensation and doesn't get recognized enough for her talents, hard work, passion, and drive. She really is the ultimate Weekend Girl... did we mention she couldn't look any more fabulous while furiously writing fabulous new articles!? She's a pure delight and a pleasure to know. Brittany always has the ability to light up a room with her smile and confidence. Be sure to add www.StyleRepublicMagazine.com to your reading list and get to know one of our favorite Editor-in-Chief's in our interview below!